Nickname Christian A. Solaas also went by the name of Christ. Christian A. Solaas was born on 25 March 1880 at Belle Fourche, Butte, South Dakota, also reported as Union, South Dakota. He was the son of Lars Peterson Solaas and Selma Augusta Peterson. Christian A. Solaas married Margreta Sjursdtr. Nesheim on 25 October 1911. Christian A. Solaas died on 6 July 1946 at heart attack at age 66. He was buried after 6 July 1946 at Gustave Cemetery, south of Camp Crook, Harding, South Dakota, Location D1. [S246] U.S. Federal Census 1880 U.S. Federal Census, by Ancestry.com, NA Film Number T9-0115 Page Number 409A. Page 13. Dwelling 118. [S245] U.S. Federal Census 1900 U.S. Federal Census, by Ancestry.com, ED340. Dwelling 160. [S244] U.S. Federal Census 1910 U.S. Federal Census, by Ancestry.com, ED430. Sheet 7B. Dwelling 122. [S243] U.S. Federal Census 1920 U.S. Federal Census, by Ancestry.com, ED94. Sheet 4A. Dwelling 10. [S250] U.S. Federal Census 1930 U.S. Federal Census, by Ancestry.com, ED32-29. Dwelling 20. Nickname Mina L. Solaas also went by the name of Minnie. Married Name 10 March 1911 As of 10 March 1911,her married name was Aust. Mina L. Solaas was born on 10 September 1882 at Beresford, Union, South Dakota, also reported as Sep 1881. She was the daughter of Lars Peterson Solaas and Selma Augusta Peterson. Mina L. Solaas married Martin W. Aust on 10 March 1911 at Sioux City, Woodbury, Iowa. Mina L. Solaas died on 15 February 1921 at Vermillion, South Dakota, at age 38. [S243] U.S. Federal Census 1920 U.S. Federal Census, by Ancestry.com, ED60. Dwelling 55. Name Variation Peter L. Solaas was also known as Peder L.
Peter L. Solaas was born on 26 July 1883 at Union, South Dakota. Peter L. Solaas married Christina Berg, daughter of Oree A. Berg, circa 1904 at Union, South Dakota. Peter L. Solaas died in January 1959 at Union, South Dakota, at age 75. [S244] U.S. Federal Census 1910 U.S. Federal Census, by Ancestry.com, ED431. Dwelling 44. [S243] U.S. Federal Census 1920 U.S. Federal Census, by Ancestry.com, ED 252. Dwelling 38. [S250] U.S. Federal Census 1930 U.S. Federal Census, by Ancestry.com, ED64-15. Dwelling 91. Married Name 30 July 1879 As of 30 July 1879,her married name was Solaas. Selma Augusta Peterson was born on 11 July 1860 at Toarp Parish, Hjortyd Ostergard, Sweden, also reported as 1 June 1860. She was the daughter of Peter Karlsson and Christina Karlsdotter. Selma Augusta Peterson married Lars Peterson Solaas, son of Peder Thoresen and Marit Mortensdtr, on 30 July 1879 at Union, South Dakota. Selma Augusta Peterson died on 12 April 1889 at Union, South Dakota, at age 28. She was buried after 12 April 1889 at Roseni Lutheran Cemetery, Beresford, Union, South Dakota. Selma Augusta Peterson immigrated with Peter Karlsson and Christina Karlsdotter on 22 April 1868. Married Name 1904 As of 1904,her married name was Hanson. Emma Solaas was born on 26 March 1886 at Union, South Dakota, also reported as Mar 1885. Emma Solaas married Cornelius Hansen in 1904 at Union, South Dakota. 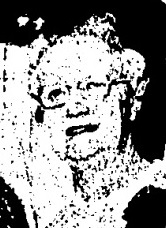 Emma Solaas died on 25 November 1962 at Akron, Iowa, at age 76 may be 1974. Emma Solaas had 4 with 1 living in 1910 children. [S244] U.S. Federal Census 1910 U.S. Federal Census, by Ancestry.com, Page 2B. ED430. Dwelling 26. [S243] U.S. Federal Census 1920 U.S. Federal Census, by Ancestry.com, ED 252. Dwelling 40. [S250] U.S. Federal Census 1930 U.S. Federal Census, by Ancestry.com, ED64-15. Dwelling 107. Name Variation John Johansen was also known as John Solaas. John Johansen was never married. He was born on 11 April 1892 at West Sioux City, Iowa, also reported as South Dakota. He was the son of Johanna Olena Johanson. John Johansen died on 27 March 1966 at Sturgis, Meade, South Dakota, at age 73. John Johansen obtained US Social Security Card at South Dakota; last residence Belle Fourche, Butte, South Dakota. He was the son of Lars Peterson Solaas and Johanna Olena Johanson. Martin L. Solaas died on 6 April 1973 at age 79. Martin L. Solaas obtained US Social Security Card at South Dakota; last residence Spearfish, Lawrence, South Dakota. [S9] South Dakota, South Dakota Birth Records South Dakota, State File Number: 614075 (unknown file date). [S244] U.S. Federal Census 1910 U.S. Federal Census, by Ancestry.com, ED421. Dwelling 4. [S243] U.S. Federal Census 1920 U.S. Federal Census, by Ancestry.com, Sheet 18B. ED 243. Dwelling 390. [S250] U.S. Federal Census 1930 U.S. Federal Census, by Ancestry.com, ED62-10. Dwelling 3. Name Variation Bernt L. Solaas was also known as Bart. Name Variation Bernt L. Solaas was also known as Ben. Name Variation Bernt L. Solaas was also known as Bert. Bernt L. Solaas was born on 14 December 1898 at Union, South Dakota. Bernt L. Solaas died on 6 October 1978 at Rapid City, South Dakota, at age 79. Bernt L. Solaas obtained US Social Security Card at South Dakota; last residence Spearfish, Lawrence, South Dakota. [S244] U.S. Federal Census 1910 U.S. Federal Census, by Ancestry.com, ED431. Dwelling 42. [S243] U.S. Federal Census 1920 U.S. Federal Census, by Ancestry.com, ED250. Dwelling 53. [S250] U.S. Federal Census 1930 U.S. Federal Census, by Ancestry.com, ED19-19. Dwelling 40. Name Variation Anna Mahar was also known as Moher. Married Name 6 October 1915 As of 6 October 1915,her married name was Solaas. Anna Mahar was born circa 1893 at South Dakota. Name Variation Willard M. Solaas was also known as William. Willard M. Solaas was born on 10 August 1916 at South Dakota. He was the son of Martin L. Solaas and Anna Mahar. Willard M. Solaas died in January 1978 at Hanna, Carbon, Wyoming, at age 61. Willard M. Solaas obtained US Social Security Card at Illinois; last residence Hanna, Carbon, Wyoming. Name Variation Orvind J. Solaas was also known as Orvend. Orvind J. Solaas was born on 24 June 1919 at South Dakota. Orvind J. Solaas died on 20 April 1988 at age 68. Orvind J. Solaas obtained US Social Security Card at South Dakota; last residence Memphis, Shelby, Tennessee. Name Variation Margreta Sjursdtr. Nesheim was also known as Margaret S.
Married Name 25 October 1911 As of 25 October 1911,her married name was Solaas. Margreta Sjursdtr. Nesheim was born on 25 July 1879 at Vossestrand, Hordaland, Norway. She married Christian A. Solaas, son of Lars Peterson Solaas and Selma Augusta Peterson, on 25 October 1911. Margreta Sjursdtr. Nesheim died on 19 September 1919 at age 40. She was buried after 19 September 1919 at Gustave Cemetery, Harding, South Dakota, Location D2. Married Name Her married name was McKenny. Name Variation Gladys S. Solaas was also known as Gladys H.
Gladys S. Solaas was born circa 1915 at South Dakota. She was the daughter of Christian A. Solaas and Margreta Sjursdtr. Nesheim. Gladys S. Solaas lived at Oregon. Married Name 27 September 1941 As of 27 September 1941,her married name was Rothermel. Lillian C. Solaas was born circa 1917 at South Dakota. Lillian C. Solaas lived at Belle Fourche, South Dakota. Married Name Her married name was Offerdal. Bertha M. Solaas married Sam B. Offerdahl. Bertha M. Solaas was born circa September 1919 at South Dakota. Bertha M. Solaas lived at Belle Fourche, South Dakota. [S250] U.S. Federal Census 1930 U.S. Federal Census, by Ancestry.com, ED56-30. Ward 2. Dwelling 272. Married Name circa 1904 As of circa 1904,her married name was Solaas. Christina Berg was born circa 1874 at Norway. She was the daughter of Oree A. Berg. Christina Berg married Peter L. Solaas, son of Lars Peterson Solaas and Selma Augusta Peterson, circa 1904 at Union, South Dakota. Christina Berg immigrated with Oree A. Berg in 1892. Married Name 26 November 1935 As of 26 November 1935,her married name was Abraham. 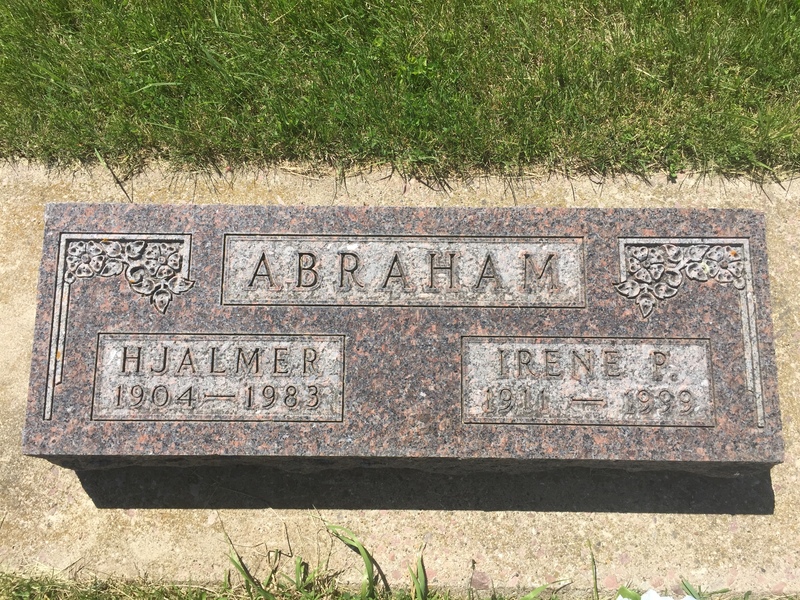 Married Name 26 November 1935 As of 26 November 1935,her married name was Abrahamson. She was the daughter of Herman N. Westberg and Ida Christine Peterson. [S9] South Dakota, South Dakota Birth Records South Dakota, State File Number: 764050 (unknown file date). [S342] South Dakota, South Dakota Marriage Certificates, 1905-1949, Spouse listed as Edward H Abrahamson. Reported as Clay County. [S184] Beresford Republic Newspaper, Vol. 106, 1999, 1 Jul. [S244] U.S. Federal Census 1910 U.S. Federal Census, by Ancestry.com, ED115. Dwelling 122. [S250] U.S. Federal Census 1930 U.S. Federal Census, by Ancestry.com, ED14-4. Dwelling 62. Herman N. Westberg was born circa 1871 at Iowa. He was the son of John N. Westberg and Martha Helena Anderson. Herman N. Westberg married Ida Christine Peterson, daughter of S. M. Peterson and unknown (? ), circa 1897. Herman N. Westberg died after May 1930. [S246] U.S. Federal Census 1880 U.S. Federal Census, by Ancestry.com, NA Film Number T9-0112 Sheet 352D. [S243] U.S. Federal Census 1920 U.S. Federal Census, by Ancestry.com, ED57. Dwelling 75. Married Name circa 1897 As of circa 1897,her married name was Westberg. Ida Christine Peterson was born circa 1870 at Illinois. She was the daughter of S. M. Peterson and unknown (?). Ida Christine Peterson married Herman N. Westberg, son of John N. Westberg and Martha Helena Anderson, circa 1897. Ida Christine Peterson died after May 1930. Married Name 25 November 1955 As of 25 November 1955,her married name was Alter. Married Name 1 August 1981 As of 1 August 1981,her married name was Derflinger. Shirley Jean Abraham was born on 17 December 1933 at South Dakota. She was the daughter of Roy Abraham and Sarah Marie Sommervold. Shirley Jean Abraham married Gerald G. Alter on 25 November 1955 at Brule Creek Lutheran Church, Union, South Dakota, Shirley Jean Abraham and Gerald Alter wedding announcement. Shirley Jean Abraham died on 4 December 2002 at Iowa at age 68. In March 1977 at Sioux City, Iowa, celebrated Roy and Sarah (Sommervold) Abraham's 48th wedding anniversary. Donald Ray Abraham was born on 20 September 1935 at Spink, Union, South Dakota. He was the son of Roy Abraham and Sarah Marie Sommervold. 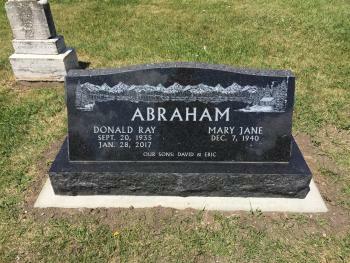 Donald Ray Abraham was baptized on 11 October 1935 at Brule Creek Lutheran Church, Union, South Dakota. He died on 28 January 2017 at Norman, Cleveland, Oklahoma, at age 81 Donald Ray Abraham of Elk Point, SD died January 28, 2017 in Norman, OK while visiting family members. A memorial service will be held February 4, 2017 at 10:30 am at Brule Creek Lutheran Church of rural Elk Point with Pastor Steve Martens officiating. The family will be present one hour before the service. Donald was born September 20, 1935 to Roy and Sarah (Sommervold) Abraham near Spink in rural Union County South Dakota. All four of Don's grandparents were born in Norway. He was the second child of the family with an older sister Shirley (now deceased) and younger brother Robert (Marilyn) of Alcester, SD. His youth was spent on his parent's farm and his education began in a one-room school house called Pleasant Hill. He graduated from Alcester High School in 1954, was honorably discharged from the US Army after 3 years in 1959, graduated from Augustana College (BS) in Sioux Falls 1961, University of Wyoming (MS) 1963, Kansas State University (PhD) 1972. He married Mary J. Urbigkit in August 1963 in Riverton, WY. The couple have two sons David (Cindy) of Wauchula, FL and Elk Point, SD, and Eric (Jane) of Norman, OK, and three grandchildren Ryan, Ethan, and Emily. Don and Mary Abraham enjoyed extensive travel visiting every state in the US and 36 countries worldwide. Included in these travels Dr. Abraham was employed by Indiana University in Malaysia for 2 ½ years, and by Waldorf College in Tanzania, Africa. He was a professor of physics at the University of South Dakota for 17 years where he served as chair and retired in 1997. He pursued research in his field of nuclear physics at three National Laboratories: Los Alamos, NM, Oak Ridge, TN, and Argonne, IL as well as Kansas State University. He was the first president of the Elk Point Jefferson Educational Foundation organized to provide scholarships for EPJ students. He was a member and past president of the Lions Club in Elk Point. He has served on boards of Thrivent Financial, Bethesda of Beresford, The American Farm Bureau, Union County Irrigators, and SD Corn Producers. Don was a past council member for Brule Creek Lutheran Church, Elk Point, SD and Grace Lutheran Church, Springfield, IL. Donald's favorite pastime on the farm which he and Mary owned and operated in Union County was training saddle and driving horses. They used them for many pack trips into the Rocky Mountains, Black Hills, and other national forests. More recently he has pursued the less rigorous pastimes of playing bridge with his wife and chess with his grandchildren. He is survived by his wife, sons, brother, grandchildren and many nieces and nephews. Published in The Argus Leader on Jan. 31, 2017. 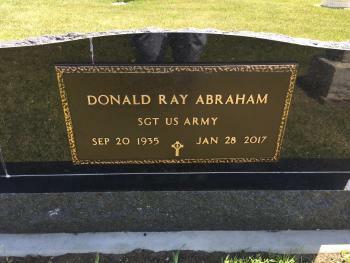 He was buried after 28 January 2017 at Brule Creek Cemetery, Spink, Union, South Dakota. 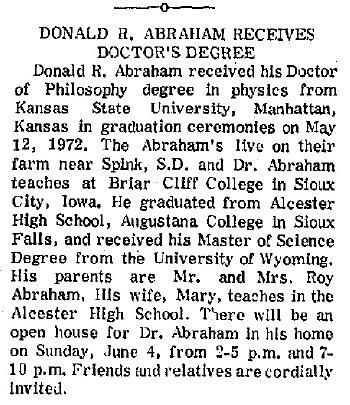 In May 1972 Donald R Abraham receives Doctor of Philosophy degree in physics from Kansas State Universiry. Irene P. Kempston was born on 21 September 1911 at Beresford, Lincoln, South Dakota. She was the daughter of Charles Kempston and Marie (?). Irene P. Kempston was baptized on 3 December 1911. She married Hjalmer Abraham, son of Peder Abrahamson and Julia Christine Christensen, on 24 February 1927 at Canton, Lincoln, South Dakota, Hjalmer Abraham and Irene Kempston wedding announcement. She was buried after 4 August 1999 at Brule Creek Cemetery, Union, South Dakota. Irene P. Kempston obtained US Social Security Card at South Dakota; Last residence Beresford, Union, South Dakota. On 15 September 1935 at Spink, Union, South Dakota, attended Abraham Family Reunion at home of Mrs Julia Abraham. 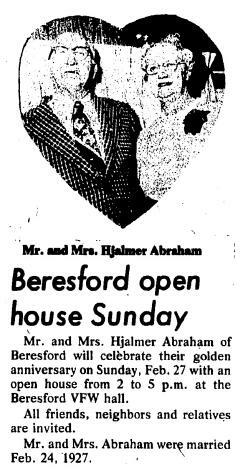 In February 1977 at Beresford, Union, South Dakota, Hjalmer and Irene (Kempston) Abraham 50th wedding anniversary. She lived in 1994 at 110 E OAK ST , 9, Beresford, South Dakota. [S184] Beresford Republic Newspaper, Vol. 106, 1999, Aug 12. [S243] U.S. Federal Census 1920 U.S. Federal Census, by Ancestry.com, ED129. Sheet 5B. Dwelling 33. [S250] U.S. Federal Census 1930 U.S. Federal Census, by Ancestry.com, ED64-15. Dwelling 35. Married Name 1954 As of 1954,her married name was Feay. Married Name 13 February 1971 As of 13 February 1971,her married name was Swanson. Moneta Irene Abraham was born on 13 July 1927 at South Dakota. She was the daughter of Hjalmer Abraham and Irene P. Kempston. Moneta Irene Abraham married Oliver Joseph Feay in 1954. Moneta Irene Abraham and Oliver Joseph Feay were divorced in 1961. Moneta Irene Abraham obtained US Social Security Card at Iowa; last residence Pahrump, Nye, Nevada. She lived in 1995 at 110 E Oak St Apt 9, Beresford, South Dakota. [S184] Beresford Republic Newspaper, Vol. 103, 1996, Jul 11. [S250] U.S. Federal Census 1930 U.S. Federal Census, by Ancestry.com, ED64-3. Dwelling 283. Name Variation Fred John Halvorsen was also known as Halverson. Name Variation Fred John Halvorsen was also known as John Fred. Name Variation Fred John Halvorsen was also known as Halvorson. Fred John Halvorsen was born on 20 June 1892 at Union, South Dakota. He was the son of Ingebret Halvorsen and Ingeborg Nilson. Fred John Halvorsen married Minnie Abraham, daughter of Peder Abrahamson and Julia Christine Christensen, on 16 August 1924. Fred John Halvorsen died on 31 January 1978 at age 85 AKRON, Iowa—John F. Halvorsen, 85, of Akron, died Tuesday at a Knoxville hospital of long illness. Services will be at 10:30 a.m. Friday in the Schroeder Funeral Home at Akron. The Rev. David Roy will officiate and burial will be in the Riverside Cemetery. Graveside rites will be conducted by Hoschler American Legion post. Mr. Halvorsen was born June 14, 1892, in Union County, S.D. He married Minnie Abrahamson Aug. 16, 1924, at Elk Point, S.D. He worked on farms in the area for many years. He was a veteran of World War I. Mrs. Halvorsen died in November, 1977. Survivors include a son, Dwayne of Earlton, N. Y; two daughters, Mrs. Jake (Gloria) Stotz of Akron and Mrs. Marshall (Donna) Wates of Gary, Ind; four grandchildren; two great-grandchildren, and two sisters, Mrs. Frank Jacobs of Akron and Mrs. John Aalfs of Sioux Falls, S.D. [S245] U.S. Federal Census 1900 U.S. Federal Census, by Ancestry.com, ED339. Dwelling 67. [S244] U.S. Federal Census 1910 U.S. Federal Census, by Ancestry.com, ED429. Dwelling 67. [S250] U.S. Federal Census 1930 U.S. Federal Census, by Ancestry.com, ED75-1. Dwelling 220. [S373] U.S. Federal Census 1940 U.S. Federal Census, by Ancestry.com, Year: 1940; Census Place: Akron, Plymouth, Iowa; Roll: T627_1190; Page: 5B; Enumeration District: 75-1. Name Variation Gloria Mae Halvorsen was also known as Mae Gloria. Married Name Her married name was Stotz. Gloria Mae Halvorsen was born on 26 April 1925 at South Dakota. She was the daughter of Fred John Halvorsen and Minnie Abraham. Gloria Mae Halvorsen died on 5 February 2008 at age 82 Gloria M. Stotz, 82, of Akron, died Tuesday morning, Feb. 5, 2008, at the Akron Care Center in Akron. Services 10:30 a.m. Friday at Immanuel Lutheran Church, E.L.C.A. in Akron. The Rev. Dawn Quame will officiate. Burial will follow in Riverside Cemetery in Akron. Visitation will be after 4 p.m. Thursday with the family from 6 p.m. to 8 p.m., and a prayer service at 7 p.m., all at Carlsen Funeral Home - Schroeder Chapel in Akron. Name Variation Dwayne Fred Halvorsen was also known as Duaine F.
Dwayne Fred Halvorsen was born on 31 March 1931 at South Dakota. He was the son of Fred John Halvorsen and Minnie Abraham. Dwayne Fred Halvorsen died on 23 November 2003 at New York at age 72. Married Name Her married name was Liston. Married Name before 1977 As of before 1977,her married name was Wates. Donna Rae Halvorsen was born on 28 June 1938 at South Dakota. Donna Rae Halvorsen married Marshal Wates before 1977. Donna Rae Halvorsen died on 15 July 2000 at Iowa at age 62. Joyce Ruth Halvorsen was born circa June 1926 at South Dakota. Joyce Ruth Halvorsen died in 1948. RuAdene Halvorsen was the daughter of Fred John Halvorsen and Minnie Abraham. RuAdene Halvorsen died before 1977. Ole Christopherson Ronnei was born on 27 October 1901 at Lysten, Norway. He was the son of Christopher Nels Ronnei and Christina Olsdotter Valde. Ole Christopherson Ronnei married Marie Abrahamson, daughter of Peder Abrahamson and Julia Christine Christensen, on 20 January 1939 at Seattle, Washington. Ole Christopherson Ronnei died on 5 March 1998 at Kirkland, Washington, at age 96 "Ole was here when Novelty came and went, when the railroads were built and later left, when the riverboats were used to haul milk, cream and other goods until railroads and highways came along," wrote local historian Bob Kosters in an article that appeared in the Nov. 25 issue of the Wagon Wheel,published by the Duvall Historical Society. "Through all those years of change the Ronneis stayed on the farm, seeing farming methods change, their friends and neighbors pass from the scene," wrote Kosters. "Now Ole and sister Nellie are the only surviving members of the original Ronnei family that came from Norway so many years ago." Ole Ronnei died March 5 in Kirkland at the age of 96. Ole was born in Norway in 1901, but the family moved to the Novelty area south of Duvall when he was just a year old. Ole and Marie Abrahamsen were married in 1939 and have always lived on the farm he purchased from his father. "In his younger days, Ole worked for a time as a logger and at other jobs, but never strayed far from the Novelty farm," the Wagon Wheel article stated. "We (historical society members) believe Ole has lived in the valley longer than any other person living today." Ole also worked on a crew in 1918 building the new Novelty Bridge. Ole is survived by his wife, Marie, daughters Bonnie Amos and her husband Norman of Redmond; Lois Haddock and her husband Ed of Kirkland; sons Jerry Ronnei and wife Marilyn of Chewelah and Duane Ronnei of Carnation; sister Nellie Hermanson of North Bend, seven grandchildren, three step grandchildren, nine great grandchildren and seven step great grandchildren. Ole Christopherson Ronnei obtained US Social Security Card at Washington; Last residence Carnation, King, Washington. He was a dairy famer. He immigrated with Christopher Nels Ronnei and Christina Olsdotter Valde in 1903. [S244] U.S. Federal Census 1910 U.S. Federal Census, by Ancestry.com, ED22. Page 188A-188B. Dwelling 11. Lines 46-55. [S243] U.S. Federal Census 1920 U.S. Federal Census, by Ancestry.com, ED24. Dwelling 103. [S250] U.S. Federal Census 1930 U.S. Federal Census, by Ancestry.com, ED260. Dwelling 38.